“Now, I have a lot of hope” added Clotilde, “Before, I wouldn’t even have dared to hope to have a tree nursery. I felt too limited, financially. But I got some training in how to run a tree nursery, and how to make compost. SUCO’s technicians trained me and coached me. Now, I’m self-employed and I can actually keep on top of my family’s basic needs” Clotilde Victor Bonhomme. After 2010′s earthquake and the cholera epidemic which ensued, two major hurricanes, Isaac and then Sandy, struck in 2012. Haiti was already one of the poorest countries in the world but as a result of these natural disasters, 57% of the Haitian population is now under-nourished, while 46% of the children show signs of malnutrition. We must act now, and swiftly. If we fail to support children, men and women from Haiti with concrete actions that will boost agricultural productivity and restore people’s autonomy. Haitians risk facing a food crisis that would keep them impoverished, and dependent on foreign humanitarian aid. And such aid is not even reaching all those in need. We must reverse this tendency and now is the time to do it. 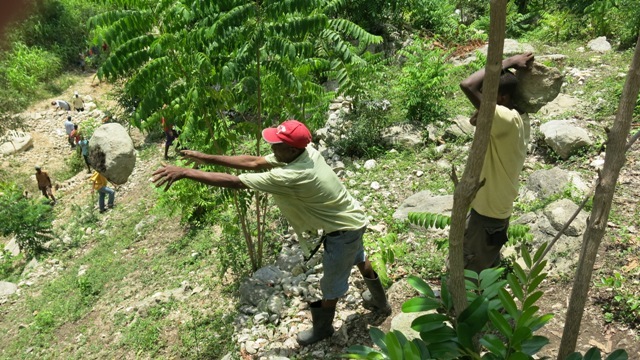 SUCO has substantial expertise in local development and sustainable agriculture and is widely acknowledged by the Haitian people and government. Like Clotilde, thousands of Haitian men and women, farmers most of them, not to mention international organizations like UNICEF and the Red Cross, trust SUCO and have confidence in SUCO to help them develop their farms and their communities. Even Haiti’s Minister of State for Agriculture, Vernet Joseph, expressed his enthusiasm for SUCO’s presence in Haiti. According to him, SUCO’s project to revive agriculture in Marigot “will have a strong positive impact on the targeted communities”. “The participatory approach on which SUCO bases its interventions is the key to the success of the Project to Revive Agriculture and Nutrition (PRAN).” – Vernet Joseph, Minister of State Agriculture. $150 will buy 150 seedlings for fruit trees. Fruit trees play a triple role of retaining water and quality soil, diversifying diets and generating income.